Malcolm Satherley’s 1970’s Terex 8240 bulldozer, parked in a transport yard near Hastings, looks gigantic. The first impression is a humongous green beast. And impressively too, with a tickle from a can of ether, it starts easily and soon demonstrates it’s still capable of a nifty turn and a bit of dirt scrapping. It may be worn and dented—its rusty heart poking through in places—and it has obviously done its fair share of pushing and shoving dirt, but heck, when that noisy GM Detroit Diesel 8-71 splutters into action and a cloud of black explodes out of its smokestack and swirls overhead, it’s marvellous. "Yeah, everyone loves that V8 sound. It makes you go for the ear muffs pretty quick, doesn’t it?" Malcolm says. "Years ago, we never wore any protection and did so much damage to our hearing, plus we worked all summer with no shirts on and used to get incredibly sun burnt." Malcolm, who used to have his own contracting business, bought the Terex 8240 about eight years ago. 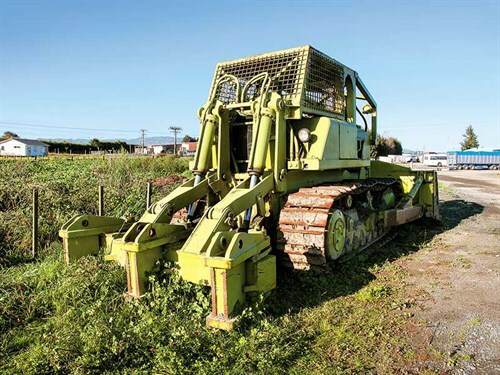 "It came from Gisborne where it was working on forestry roading contracts. We had a particular job where we needed to create a road in a large forest in southern Hawke’s Bay and we required something a bit heavier than the D6 we already owned. That job lasted two to three years before we brought it back here." He says the heavy tractor, which has a sturdy protection cage, is ideal for earth and tree moving. "There’s so much weight in it, whereas the smaller machines struggle with this sort of work." 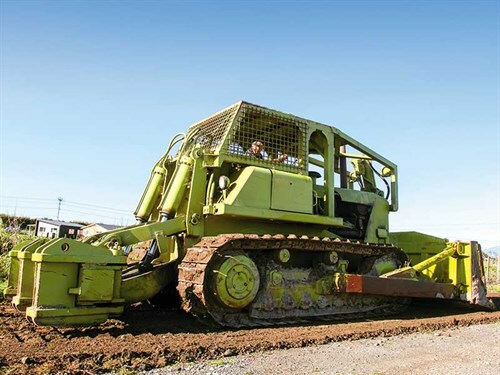 A quick look look reveals the solidity of Terex’s frame—about four inches thick of meaty steel that can handle all the pushing and shoving required of it. All up, the Terex weighs 37–40 tonnes, has a top speed of six miles per hour, and is operated by full power shift transmission with three forward and three reverse speeds. Distinctively, the radiator is mounted at the back and is cooled by a fan driven off an extension shaft from the engine. Malcolm has found this to be a great feature, especially working in the forest and moving loads of trees when there’s the danger of them getting bunched up or putting a hole in the radiator. Another feature he likes is a sight glass in the back that allows a quick check of oil levels. "This came out years later in Cats, so the idea must have been pretty good," he says. The semi-U blade, with its ability to tilt, is ideal for stump removal and bulk earthmoving. Malcolm’s sole attachment is a long ripper tine used for deep ripping vineyards to improve the drainage in the soil but there’s also the option to put on a variety of attachments, such as rippers or a winch, as required. 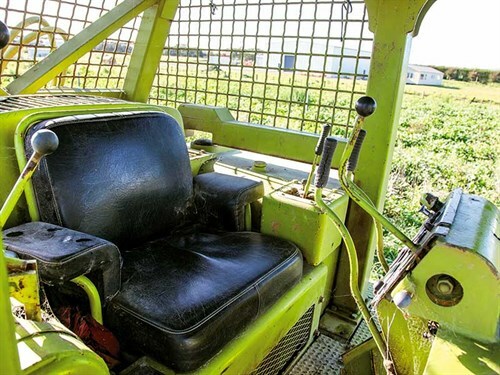 Overall, he says it’s good to operate, has plenty of room and good visibility from the cab, and easy controls. "Mechanically, it’s treated me well. Nothing much goes wrong with these machines if you look after them. "It’s like taking an old Mark 111 Zephyr on a trip. You can’t thrash it. And since I’m now in semi-retired mode, I use it infrequently," he says. Terex machines were distributed in New Zealand by Clyde Engineering who were the agents for Euclid, as the machines were originally known, before being changed to Terex. Machines were mostly used here for large earthmoving or forestry jobs. Malcolm’s family history in contracting goes way back to when his father Jack operated Satherley and Sons in Dannevirke. That’s where Malcolm learned his skills and now he’s passed the baton to a third generation. 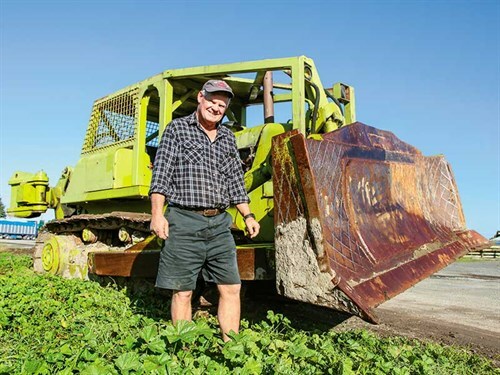 All three of his sons own contracting businesses around Hawke’s Bay: Bevan has Satherley Logging (2006) Ltd, Hayden, HES Earthmoving Limited, and Toby, ATS Logging Ltd.
so he and his wife, Kathy, can get out on the road to enjoy some scenic places around the country. He has fond memories of a life spent in the contracting business and working with machinery. "It’s a bit of a disease, isn’t it? It gets in your blood. We’ve had some really good, busy years. It’s been a great lifestyle and no regrets," he says. 1953: GM Motors purchase Euclid, developing and selling large equipment including off-highway dump trucks. Following an anti-trust suit, the US Department of Justice forces GM to stop manufacturing and selling off-highway trucks for four years and to divest parts of its Euclid business and Euclid brand name. 1970: GM comes up with the name Terex for its construction equipment products and trucks not covered by the ruling. 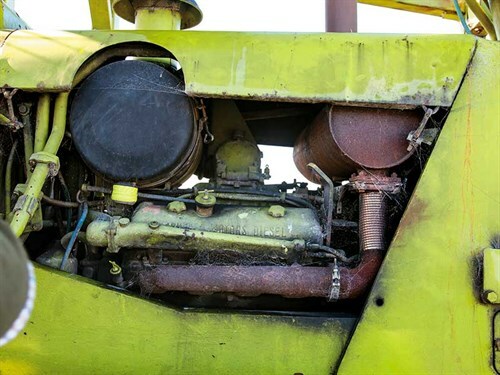 As a result, the remaining parts of the new Terex business produced crawlers, front-end loaders, and scrapers.